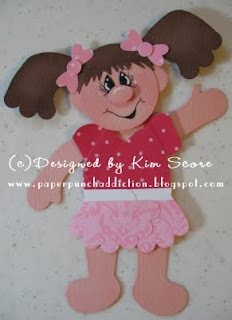 Paper Punch Addiction: Build a Bear becomes a girl! 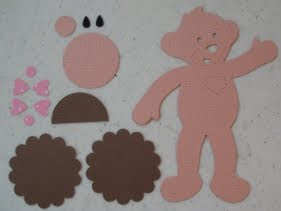 This tutorial is for those of you that aren't bear fans. 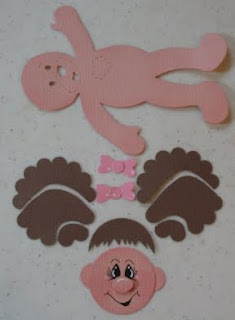 The build-a-bear sizzix die can be adapted to a lot of different characters - one of which is a cute little kid. These instructions are for making a girl. You could easily leave off the pony tails and make a boy. 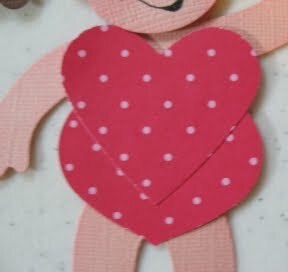 If you want instructions on making a jointed kid, check out my class for the Build a Bear (with lots of great outfits for your paper doll). 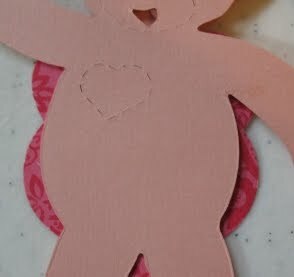 Die cut build a bear out of blush blossom cardstock. Clip off the ears and hair. Trim one of the 1/2" circles into an oval for the nose. Punch 2 of the 1/2" circles for ears. 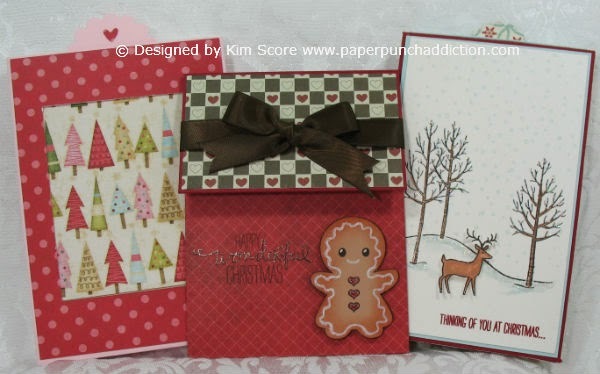 Sponge edges of all blush blossom pieces with pretty in pink ink. Attach nose with dimensional. Glue on ears. Glue on teardrop eyes. Add detailing with uni-ball white gel pen and zig detail black pen. Attach face to head with dimensional. For hair, cut 1 3/8" chocolate circle in half. 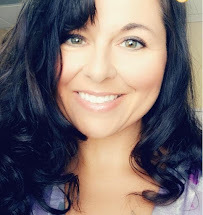 Clip on edge to create bangs. Clip scallop circles as shown for ponytails. Sponge chocolate pieces with chocolate chip ink. Glue bangs and ponytails to head. 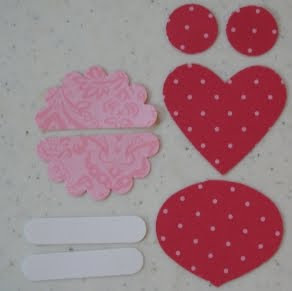 For hair bow, glue 2 small hearts on each side of 1/4" circle. Make 2 bows and use a glue dot to attach to ponytails. 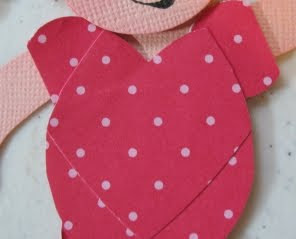 For the shirt, glue the full heart on top of the ornament. Attach to body. Turn body over and clip away excess. Clip away bottom of each 3/4" circle for sleeves. Glue sleeves onto blouse. Glue 2 word windows together for waistband of skirt. 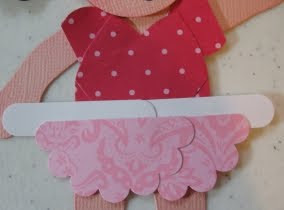 Cut scallop circle in half and glue onto waist band. Glue skirt onto blouse, turn over and clip away excess on each side of the skirt. I love this. 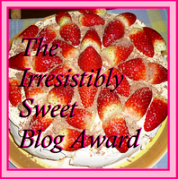 Thanks for sharing it freely. Oh, my goodness!!! That is just too adorable. Great job. You have outdone yourself again. These are such cute ideas. I loved it. Great idea. Great Job!! Love this idea. 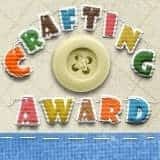 Thanks for sharing your tutorials with us! !